Floating the Deschutes River – Everything You Need to Know! Here you will find everything that you need to know to be safe and have a BLAST! will be revoked. Of course we are just kidding, but it is that popular! The Deschutes River float is one of the most popular and fun endeavors that you can enjoy in the beautiful city of Bend. The easiest place to begin your float is from the Riverbend Park or the Farewell Bend Park. Both are close to eachother, just on opposite sides of the river. Do you know where the Bill Healy Memorial Bridge is? Well then you’re close! The RiverBend Park is just downstream from the bridge, and the Farewell Bend Park is just upstream from the bridge. Either of these places offer a safe and sandy shore for you to launch your choice of floatie, whether that be an air mattress, float tube, raft, paddle board, ect. Under Oregon law, all boats must carry a Coast Guard approved personal floatation device (PFD) for each person on board or being towed! Well, what counts as a boat? A boat is considered an inflatable raft, kayak, canoe, ect. Anyone 12 years of age and under must wear a PFD at all times! Head on over to Riverbend Park and look for the little trailer with the Sun Country Tours logo on the side of it! They rent out float tubes, standup paddleboards, and they loan free PFD devices to children 12 years and under! For those that are over 12 years of age a PFD is just $2. A tube rental is $10 for children 12 years and under, $15 for grownups for the first two hours, and $5 for each additional hour after that. Another option for Rentals is the Tumalo Creek Kayak & Canoe. The tube rentals are $10 for 2 hours or $20 a day! They also rent PFD’s, canoes, kayaks and standup paddle boards and are conveniently located close to the Old Mill District! There are a couple of different options for your route – When you reach the Colorado Avenue bridge, you have the option of hopping out and concluding your float here or walking around the bridge, getting back into the river and continuing your float all the way down to Drake Park. 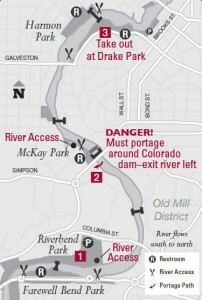 See this map for launch points and where to exit the river. The shuttle is the easiest option as it is available 7 days a week! The Ride the River shuttle operates Friday through Monday and you can find the schedule HERE. The cost is $1.50 for individual rides or $3 for an all day, waterproof bracelet that entitles you to unlimited rides. Sun Country also operates a shuttle Tuesday through Thursday when the Ride the River is not operating. It’s just $3 for an all day pass! Alright, so now you are all set with your floatie, route, rules and return plan! Now here are a few tips and tricks to keep in mind while you are floating..
1. Have water shoes (ones that stay on your feet) -many have lost flip flops in the muck and mud when trying enter or exit the river. Going shoeless seems like a good idea until you hop out of the water and realize you need to walk across hot and rocky landscapes! 2. Keep your sunglasses safe and secure by tethering them around your neck. 3. Watch out for those signs when you get close to the Colorado Avenue Bridge – This is very well marked and pretty obvious as where you are to exit, and don’t worry, you have plenty of time to exit; however, you still have to watch for it and pay attention. Heading over the spill way would be a lousy way to end your floating trip! 4. No drinking alcoholic beverages – Seriously, this is not the place for impaired judgment! You need to be aware and safe while floating the river. 5. Protect native plants and wildlife – Bend is a beautiful place and we all want to keep it that way for many years to come! 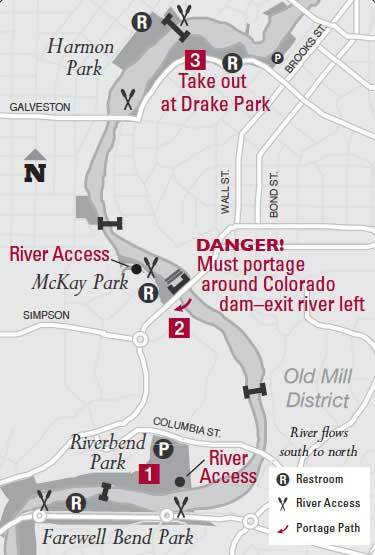 Put in and take out of the river at the designated boat landing and portage paths. 6. Help keep the river clean! Make sure to secure all of your gear to avoid disposal of garbage into the river. Do you have any questions about floating the river? Ask away, leave a comment below! This might just be a problem on your browser because i don’t see that happening on mine.